I'd consider the front door to be an important element of a home and a new front door is definitely on our shopping list since I don't particularly like our current navy stained-window door. Choosing the right style of door can make all the difference to first impressions of a home and I believe it sets the scene for the rest of the home decor. Panel doors seem to be are one of the best door styles available. They are versatile, and blend in well with most home decor styles. Repainting it and changing the handles are an easy way to update the home decor too. To keep the heating/air con bills down, insulated doors are a good choice. Provided they are fitted properly, these will keep the rooms at the right temperature by keeping the heat or cooled air in, rather than letting it leak into the corridor. Some homes are a bit on the dark side, especially older homes, which have small windows. If this is the case then interior doors that include glass panels can help let in more light. G is always careful when it comes to safety and security in our home, and fire doors designed for use in the home is a good idea. These look just like normal doors, but are designed to keep smoke and fire at bay for far longer than ordinary ones do. This shop http://www.doorstore.co.uk/ has some great door styles with the English charm that I'm looking for and all with very reasonable prices. They also sell a range of handles and locks. I can't wait to show you guys the front door I'll end up picking! 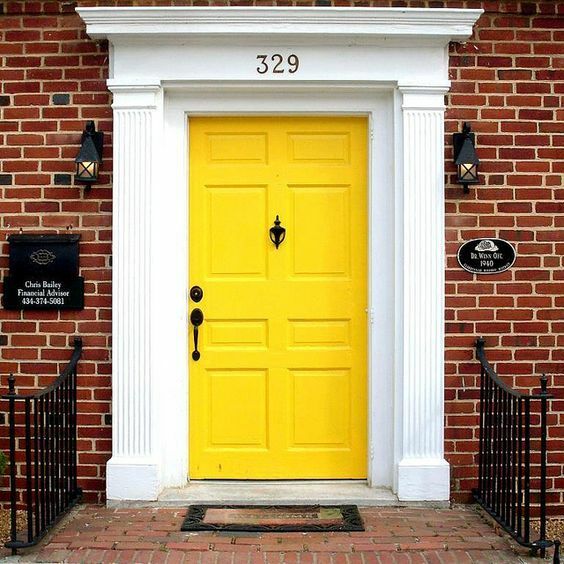 Do you think a yellow front door is too bold?